UU Ministry for Earth and the Unitarian Universalist Association both endorse the Promise to Protect call to action and encourage Unitarian Universalists to prepare for a potentially massive escalation to prevent TransCanada’s Keystone XL (KXL) pipeline. A presidential permit for the pipeline was just issued on March 29, 2019, meaning that construction is likely to be fast-tracked despite recent court rulings calling for more environmental review. 1. Read the #NoKXL Promise to Protect Call to Action and add your name if you feel called. If you want to join a coordinating circle of UUs commited to the Promise to Protect, join the “NO KXL – Promise to Protect” group on Create Climate Justice Net. 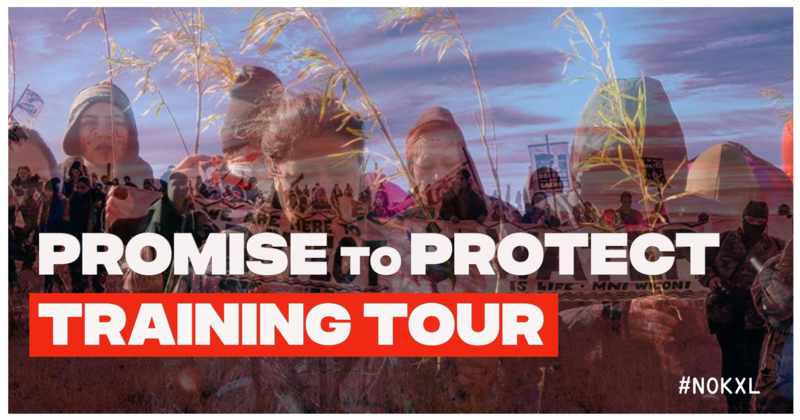 The Promise to Protect Training Tour kicked off on March 23rd, and is taking place in 10 cities and 4 reservations, with a goal of training 2K+ people for direct action to stop the Keystone XL (KXL) tar sands pipeline. Despite numerous court rulings denying permits, the Trump administration has issued another presidential permit to fast track the project without further environmental review. Native and non-Native environmental justice activists will come together to take powerful collective action along the pipeline route and in our local areas. Our UU faith calls us to heal our relationship with the earth through action in solidarity with those resisting the fossil fuel industry’s extraction and exploitation of people, resources, and lands.